Creating this was a bit of R&R for myself. After what has happen around me and my family; we all need a bit of alone time to recover in our own way. Returning to normal is never easy but we are all doing very well (thanks to all your support followers! It has made a big help). However, I fall in to the 2nd category. Keeping busy, keeping busy; do not stop to think. School, shopping, cooking/baking, photo editing, blog catch up, cleaning and organizing have become the orders of the day. Reflection and rest are things I am not well versed in and I am not really ready to deal with my emotions just yet. Come to think of it, I am not ready to deal with the realities beyond the situation; I am just like everyone else. Unstable, emotional and ultimately, just being human. I am morn the times when the most trauma thing to happen to me was the simple bath room spider or minor car crash. I look at others who have healthier ways of recovering from terrible events with envy. However it is easy to envy the past and others; what is hard is to find the will to develop those traits yourself. Thank goodness my memory has not been affected because I am holding on to the belief that the simple advice from a word documented print out holds true. Number four in the booklet but it should be number one (or at least highlighted as the last point), No one can tell you how or when you recover but allow for plenty of time to find your feet. I guess it means I can bake more selfishly can’t I? I might make a lot of bread and cake but simple desserts like this are something of rare occurrence. It is not that I dis like these recipes but the way people describe how easily it is to get wrong has me running scared. Who loves cheese? I do! So stay turned best if you are fan of cheese plate; I got the dessert for you. It is quick, simple, and will prove to all your foodie friends you know your stuff when it comes to flavours. 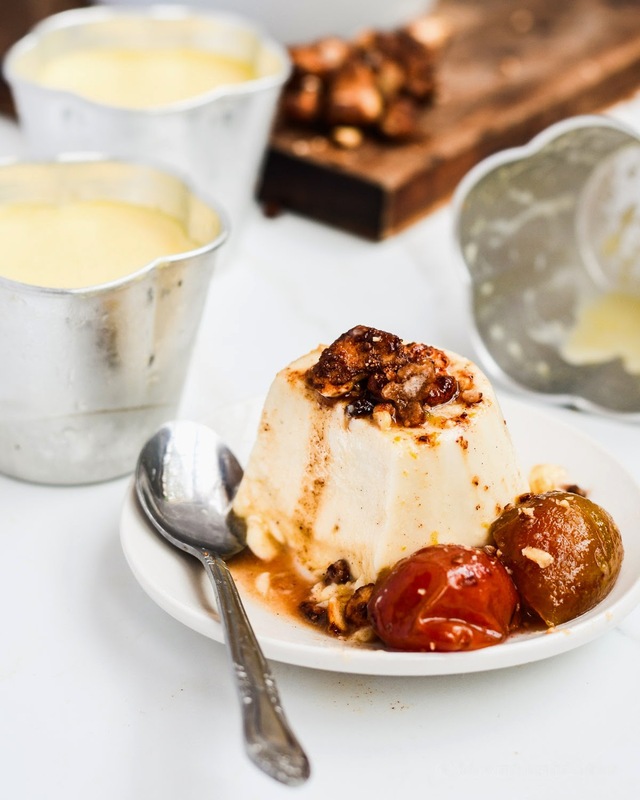 At its best panna cotta has a just set consistency which glides across the plate. The custard taste should not be too strong (suggesting it has been over cooked) but a compliment to the flavours the baker chooses to use. I know blue cheese may seem like an adventurous choice for a sweet dessert however here me out. The mid mellow hum of blue cheese may taste “funky” on the first go but you will be unable to put the fork down. 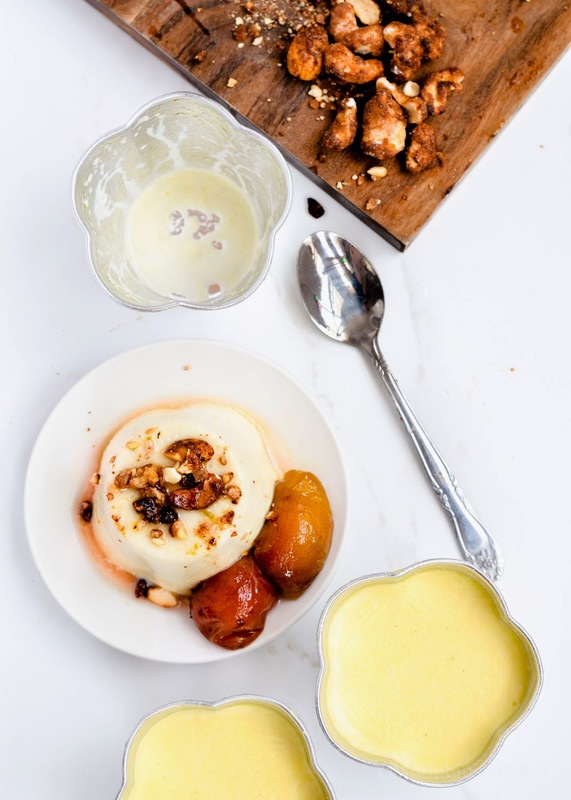 If you are not a fan of really sweet desserts; this custard is very balanced when you pair it with late season’s sugar plums. 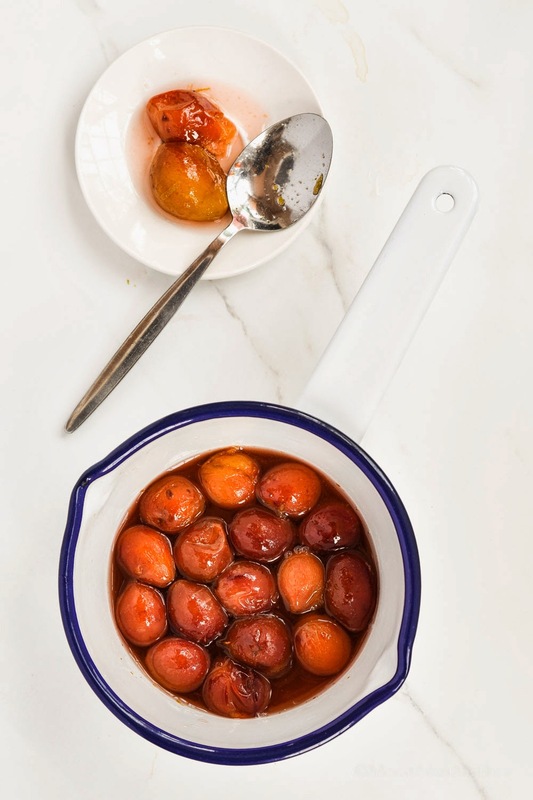 Poached in a syrup of verjuice, sugar and mid spices; the intense natural sweetness of plums and honey are all the sweeteners you need in this dessert. 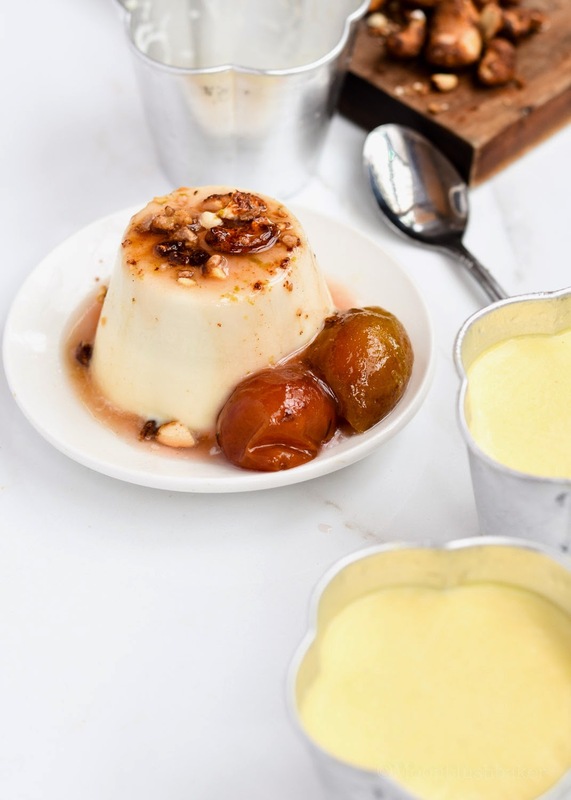 This is why there is only 40g of sugar in the panna cotta for 4 people but you will hardly miss this if you skipped it all together; the plum syrup is my favorite part. If you are looking for a dessert that will get your friends tongues wagging, give it a go. It will surely make for good conversation. Combine milk, cream, sugar and vanilla bean in a saucepan over medoin to low heat. Cook this until well warmed and just below boiling. Add your crumbled blue cheese and whick to combined. Strain the mixture through a fine sieve. Whisk and dissolve your gelatine powder in the hot water. Whisk the gelatine into the cream mixture until well combined. Transfers to a jug and Divide among metal moulds. Cover with plastic wrap and place in the fridge for 6 hours to set. When serving Dip each panna cotta into hot water for 1-2 seconds. Place a plate on top and quick flip it over. You may need to give a gentle wobble to get it loose. 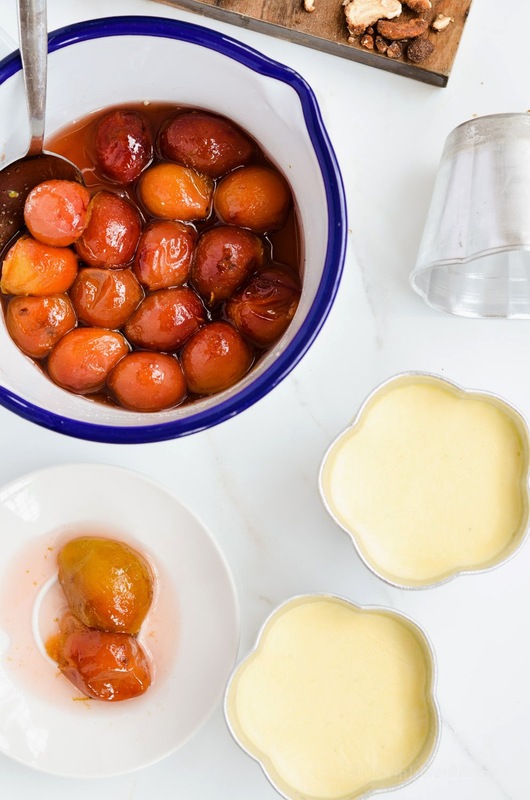 Serve with poached plums. Poached sugar plum in honey verjuice. In a medium sauce pan over low heat warm honey, water, verjuice, and spices till just below boiling. Leave to in fuse for 10 minutes. Strain syrup through a sieve to remove spices. Return syrup to the stove and add plums. Bring the syrup and plums to a simmer and cook out for 10 minutes or until well soften but not mushy. Test with a knife; if it gives way when gently pressed it is ready. Serve warmed or room temp over the panna cotta. 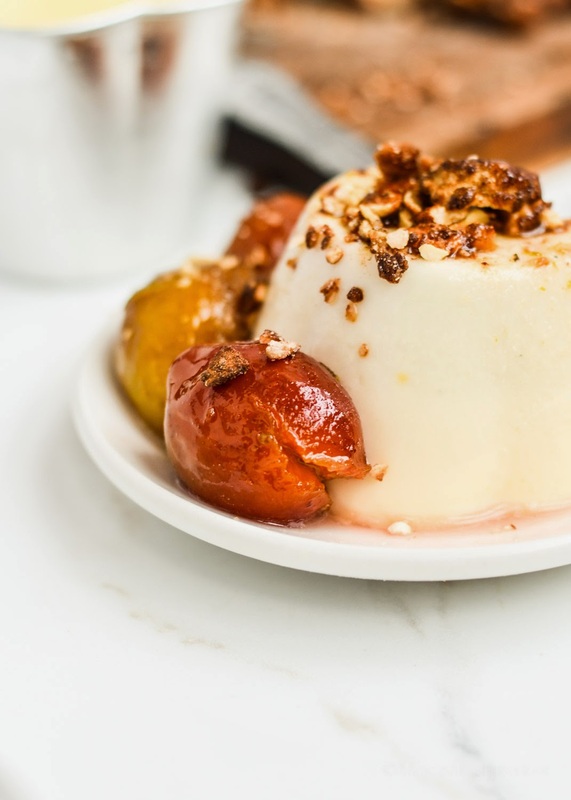 This panna cotta looks beautiful! I’m sorry for your loss. I’ve been reading your blog for some time now but never commented. After having read the tragic news in your family I feel the need to express my condolences.Hope you find strength in your routine and that you will let yourself grieve as much as you need to. Im thoroughly impressed by your food and photography skills and will be back often to see what else you’ve cooked up! Thanks Archana! I love to hear from silent followers, or anyone for that matter. I am flattered that you like my photos; it is so nice of your to comment this time. This dessert is incredible. My heart goes out to you. Thank you Karly. I am so glad you like this post. also thank you for your sympathies.